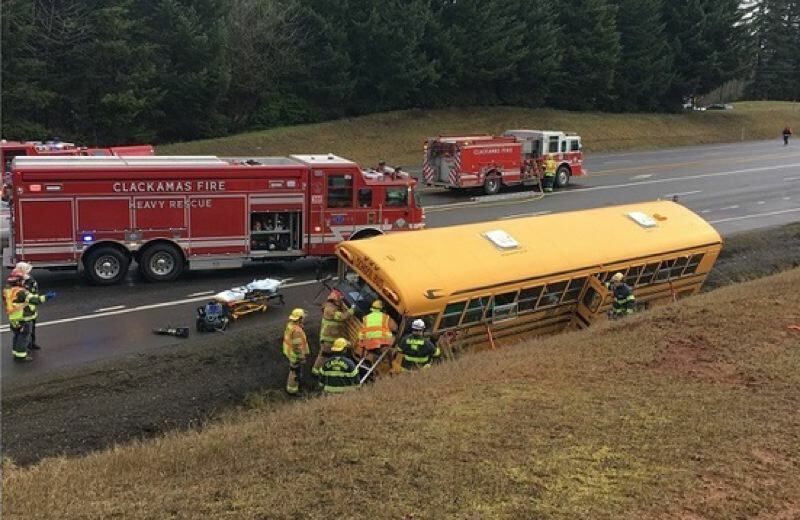 A school bus and two cars collided in Clackamas County around 10 a.m. Tuesday — causing an unknown amount of injuries. The bus, filled with 27 band students from Alice Ott Middle School in the David Douglas School District, was on the way back to Portland from a music event at Sandy High School. Dan McCue, communications director of David Douglas said six students were taken to the hospital to be checked out "but it didn't appear the injuries were serious." The bus driver and the two car drivers also were taken to the hospital, KOIN said. The crash happened along Southeast Highway 26 and Orient Drive in Boring, Clackamas Fire officials told KOIN 6 News. The bus driver had to be extricated from the vehicle. All students are off the bus and were evaluated by paramedics. David Douglas sent another bus to transport the students back to school. The district operates its own buses and does not use an outside vendor. Highway 26 at Orient Drive was blocked in both directions, but reopened. KOIN 6 is a media partner of Pamplin Media Group contributed to this story.